To those new in this blog, I track my spending every month. 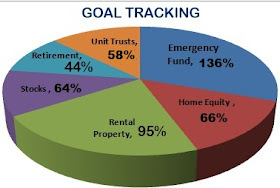 My goal for 2012 was to spend 50% of my income in order for me (and hubby) to retire comfortably in early 40s. My December 2012 monthly spending and budget report is a bit late. I had an "end of the year" burn out and no blogging time. November was a great month. I spent only 46% of my income. December has been taxing. I poured more than R30k into my small online business. It was actually close to R40,000 of my savings. I think I had to, to grow my online income for 2013. So naturally I overspent this month. Too high for my liking. Hubby Allowance 62% 33% I included the money from savings here which went to boost the online business. Once Off 0% 1% Interest free loan payment by my friend. Online Income 0% 0% I will get three months worth this month. I did. I finally receive a fat cheque this month. I only deposited it in January. Extra 5% 8% Interest on my Emergency Fund. Plus dividends, AGAIN. I so love Dividends. I wont lie about it. RA & Unit Trusts 5% 7% Fixed for my life insurance and the rest of small investments. Some of which I regret. Online 65% 0% A necessary and profitable expenditure I think. Giving 18% 16% This doesnt seem to want to habour at around 10-12%. To Invest -2% 54% -2% is DISMAL!!! I paid nothing to my homeloan, but the Mr did. Like every month I didn't top my Just Invest (Nedbank) interest up. My Car Fund stroke stock picking is coming alright. I lived on 102% of my income in December (comparing to 46% in November). Our Net Worth grew by just above R157K in December. 2012 was not a high achievement year if I may be honest. But I made lots of progress. My passive income grew. My intentions were to grow the dividend income, which didnt go as planned. The next post will be on what I achieved in 2012. I am so proud of myself because I never spent recklessly. Other than a few small holidays, we were good.